One of visitors’ favorite features about our current exhibition Frank Reaugh: Landscapes of Texas and the American West, is the “guide by cell” audio tour. This audio tour lets visitors call in and hear informational snippets about the paintings. For the exhibition, Ransom Center Curator of Art Peter Mears discusses highlights from the exhibition, and Project Specialist Greg Curtis spoke as the voice of Frank Reaugh to narrate the artist’s own comments. In this installment of our 11-part audio-visual series, we feature Driving the Herd, Number 1, the Frank Reaugh painting displayed in all promotional material about the exhibition. 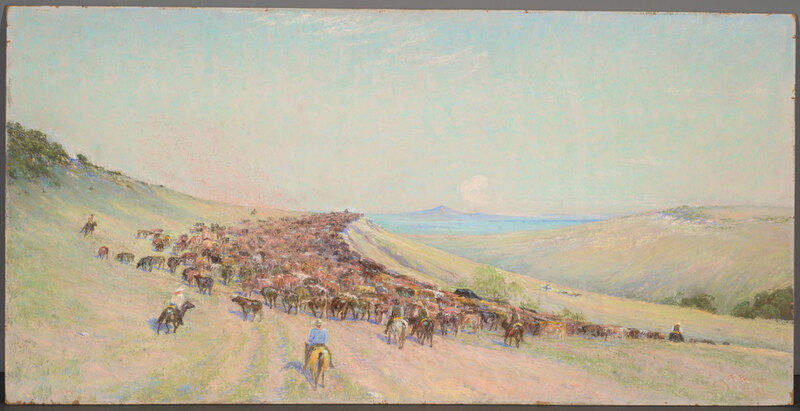 In this rich pastel composition, a cowboy guides a herd of cattle across a sloping hill. The painting is the first sequential work in the series Twenty-Four Hours with the Herd. Frank Reaugh, Driving the Herd, Number 1 from Twenty-four Hours with the Herd, 1933, pastel on board, 24 x 48 1/16 inches. As Reaugh describes it, the cowboys that worked the early range in the late twentieth century were inimitable. Traversing vast unsettled ranges, often working 16- to 18-hour days, they demonstrated a degree of stamina and resourcefulness that remains unmatched by “the rollicking rodeo man” and the “line rider on the ranch” who Reaugh saw in his later years. To learn more, listen to the audio files below. The Ransom Center offers free daily docent-led exhibition tours at noon, with additional tours at 6 p.m. on Thursdays and 2 p.m. on weekends. Peter Mear's Comments on "Twenty-four Hours with the Herd"
Frank Reaugh's comments on "Twenty-four Hours with the Herd."